Consultants gathered input on Gardner’s new comprehensive plan last week, hosting workshops with faith leaders, elected officials, the steering committee and residents. When complete, the comprehensive plan will be used for economic development purposes. Ideally, it will establish a roadmap for the city’s future. Gardner’s current comprehensive plan, which includes zoning and proposed future zoning designations, was adopted in 2003 and partially updated in 2008. Last week’s workshops were not the first time consultants drafting the plan visited with local residents. They facilitated several workshops in October designed to brain storm top priorities for the community. Dan Gardner, one of the consultants the city hired to create the new plan, said some of the top priorities from workshops appear to be improving the city’s infrastructure, promoting a business-friendly environment while maintaining the community’s small town identifications. He said citizens have expressed interest in having a new police station, revitalizing downtown and potentially finding a way to move the Johnson County Fairgrounds from the center of town to a better spot. Gardner said many citizens have noted that the city boasts primarily starter homes. The city’s median home value of $172,829 is less than that of Spring Hill, Olathe and Lawrence. “There’s limited opportunities for residents to move up,” Gardner told members of the comprehensive plan steering committee. He peppered the group with several facts about Gardner. For instance, the community is the number one manufacturer of refrigerator magnets in the world. Gardner said he anticipates Gardner’s growth will outpace that of Johnson County. By 2018, he estimates the city will gain 2,300 more residents, or grow by 12.4 percent. The county will likely grow by 7.9 percent. Members of the consulting team outlined the make-up of the current community. For example, 21 percent of the community is zoned residential, 5.6 percent is commercial, and 32.8 percent of the community including outlying areas is agricultural. Approximately 21 percent is empty. Members of the community were invited to draft their own ideas about the community’s future during a public workshop. 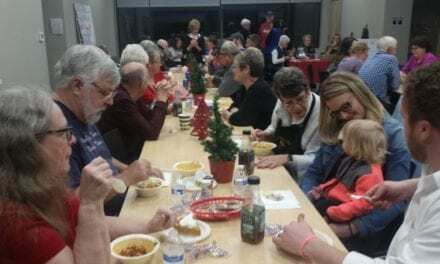 Approximately 50 patrons gathered in city hall on Jan. 29. Consultant Gardner numbered the participants and established seven groups. He gave them large maps of the community and markers. People interested in giving input for the yearlong comprehensive plan project will still have other opportunities. Future workshops will be scheduled and the consultants have set up a website. A link is available on the front of the city website at www.gardnerkansas.gov. Gardner said to date, more than 200 people have drafted their own maps via the website.